Here's something that you may find interesting ... psychological profile ... and don't be overly sensitive! Like many profiles, there are no right or wrong answers. The profile gives you a set of guidelines that I believe you will find interesting as you self-score the instrument. This is not an assessment that will take you a long period of time to complete. It poses short questions that have numerical values associated with them and then the profile can be self-scored. 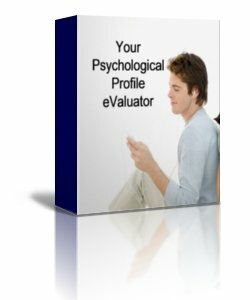 You will have fun with this profile and it will give you insights into yourself and how others perceive you to be.